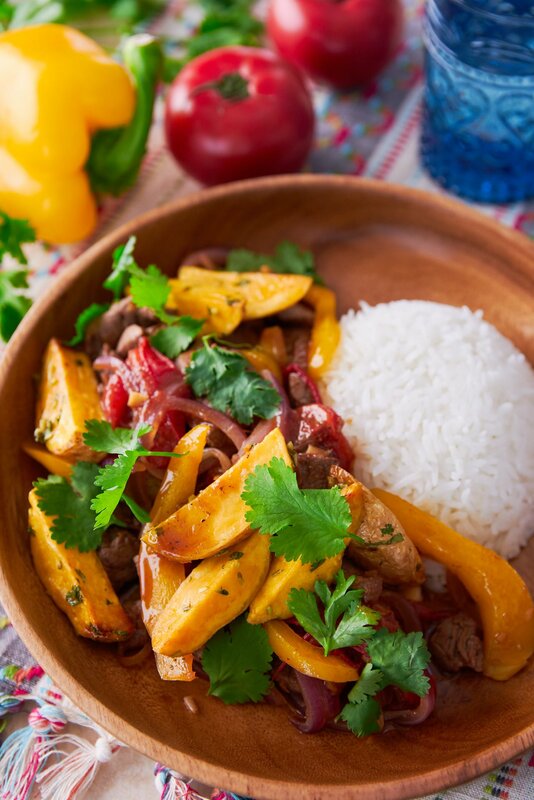 The ultimate mashup of Peruvian and Chinese cuisine, Lomo Saltado is a delicious stir-fry which combines beef marinated in soy sauce and pisco with onions, peppers, and tomatoes. It's topped with a smattering of crisp french fries and served with rice, which makes it a hearty meal that's like an explosion of contrasting colors, tastes, textures, and flavors. The US has Chinese-American cuisine, India has Indo-Chinese, and an influx of Chinese immigrants into Peru during the late 19th century created Chifa cuisine. Chifa is a unique subset of Peruvian cuisine which borrows Chinese techniques and ingredients like stir-frying and soy sauce, and applies them to locally available ingredients, creating a magical mashup that brings two worlds together. Lomo Saltado is perhaps the most famous dish representing the genre and the name literally translates to “jumped loin.” “Lomo,” or loin, is a reference to the cut of meat that’s typically used. “Saltado,” on the other hand is a reference to the cooking technique, as stir-frying involves “jumping” the ingredients around the pan. With regional as well as household variations there are as many recipes for this dish as there are cooks that make it. There are so many regional variations of this dish, it’s hard to pinpoint the exact ingredients that go into a traditional Lomo Saltado, so I’ll preface everything I write below by saying that this is my version of the classic and may differ from how your local Chifa or grandma makes theirs. The predominant seasoning in Lomo Saltado is soy sauce, which is what gives the Asian flavor to what would otherwise be a stir-fry of Peruvian ingredients. I used a standard dark soy sauce, but there’s a fair amount of wiggle room here to make adjustments based on what you can get and what your preferences are. In addition to the soy sauce, I like to add a bit of oyster sauce, which adds some umami to the sauce and it eliminates the need to add MSG (provided you’re using a real oyster sauce). Pisco is a Peruvian brandy that’s made in wine-producing regions of Peru. While it hasn’t been until relatively recently that Peruvian wine has made a splash in the US, the winemaking industry there dates back as far as the conquest of the Inca Empire by the Spanish in the 16th century. Wine was initially distilled into brandy as an additive used to preserve wine, but it soon got it’s own name and place in the pantheon of the world’s great spirits. Because the flavor of pisco varies so much by the grapes used make it, there are 4 distinct designations of Peruvian pisco: Puro (made from a single varietal), Aromáticas(made from a Muscat varietal), Mosto Verde(made from partially fermented grapes), Acholado (a blend of several varieties). I used Pisco Aromáticas as I love the fruity fragrance it imparts, but other types will work, and if you can’t find Pisco near you can substitute a grape-based brandy such as Grappa. While not all versions of Lomo Saltado use vinegar, for me it’s a must. It’s not enough to make the dish overtly sour, but it helps bring the tangy ingredients such as the tomatoes and peppers into the fold while adding another dimension to the taste profile of the dish. One significant departure from traditional recipes is that I like to season the french fries with vinegar and salt. This not only helps the salt stick to the potatoes, but it also creates a nice taste contrast that makes things pop. To enjoy the flavor of all the ingredients (and to make it kid-friendly), I kept the spices to a minimum, using some black pepper in the marinade and cilantro to finish the dish off. I’ve seen versions of Lomo Saltado that are spiced with everything from cumin to oregano to Ají Amarillo paste, and this is an area you can experiment with to find the right balance of spices for you. To adjust the heat level, I served this with a bottle of Marie Sharp’s so that everyone could customize it to their liking. I know this hot sauce is from Belize, but it happens to be one of my favorites. 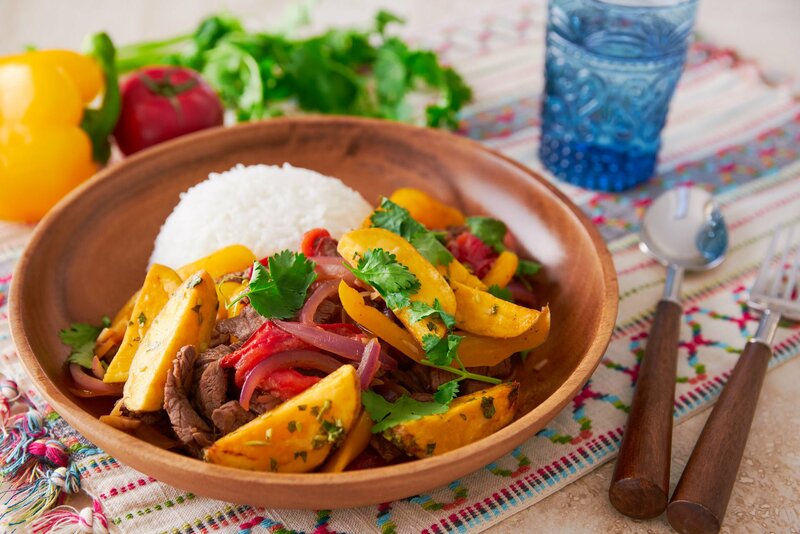 As the name suggests, Lomo Saltado is typically made with beef loin. While tougher cuts tend to be more flavorful, they need to be cooked low and slow in order to make them more tender. Since stir-fries are cooked hot and fast, you want to use a relatively tender cut of meat. With beef, there’s usually a direct correlation between tenderness and price, the more tender a cut, the more it’s likely going to cost. That’s why my recommendation here is to use the most tender cut of beef that you can afford. I used a few pieces of tenderloin. Like most stir-fries, this one starts with ginger and lots of garlic. I like to mince up my ginger as finely as possible because it tends to be both potent and stringy, but I like to leave my garlic in rougher chunks, which keeps it from burning and creates these awesome pockets of garlicky goodness. As with many ingredients in our modern pantry, chili peppers are native to South America. They eventually made their way to China, where they’re widely used in Sichuan cuisine, but including them in Lomo Saltado is not only delicious, it’s a symbolic representation of the chili pepper’s journey around the world and back. The traditional pepper to use is the Ají Amarillo, which is a long yellow pepper that’s sweet and moderately spicy, but it’s tough to find fresh outside of South America, so I’ve substituted yellow bell peppers. These can be augmented with more potent varieties of chili peppers to bring the heat, or do what I did and serve the finished dish with some hot sauce. Red onions are the way to go here for both their color and sweetness. When cutting these for Lomo Saltado, I like to slice them towards the core so that they form wedges. Tomatoes are another ingredient native to Peru, and they make a great addition to finish off this stir-fry. For most dishes, I’d advocate using the ripest tomatoes you can find, but because you don’t want the tomatoes to disintegrate, a firmer tomato is the way to go here. 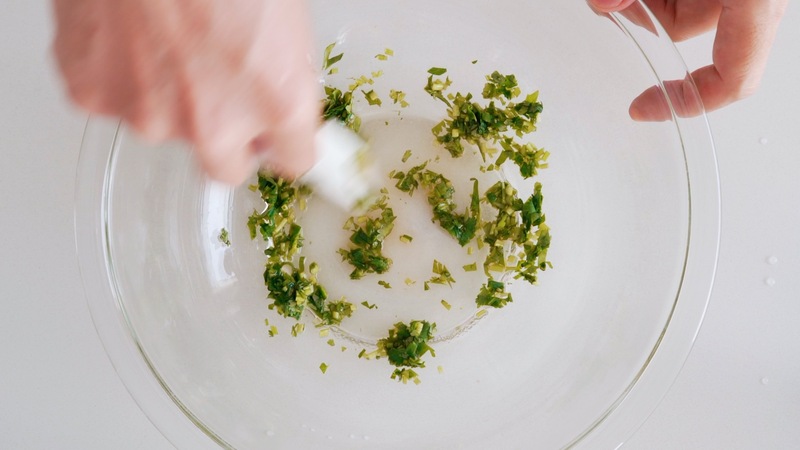 You’ll also want to remove the seeds, as the liquid around them will make the dish too watery. If you finished reading the last section wondering about the potatoes, don’t worry, I haven’t forgotten the most important part. While it may sound a bit odd to the uninitiated, Lomo Saltado is finished with a generous sprinkling of French Fries on top! This combo is brilliant on multiple levels; the most obvious of which is that all potatoes can trace their roots to Peru. Yep, you read that right, the french fry, mashed potatoes, baked potatoes, and potato chips, did not exist before the ancestors of the Inca domesticated them. Furthermore, for anyone that’s ever poured chili on your fries, or stuck some potato chips in a sandwich, you know the synergy that exists between fried potatoes and savory foods. I’ve long been a fan of throwing fries into other foods, and it’s nice to see a dish in which they are an integral component and not just an afterthought. Like most stir-fries, this one starts with marinating the meat. 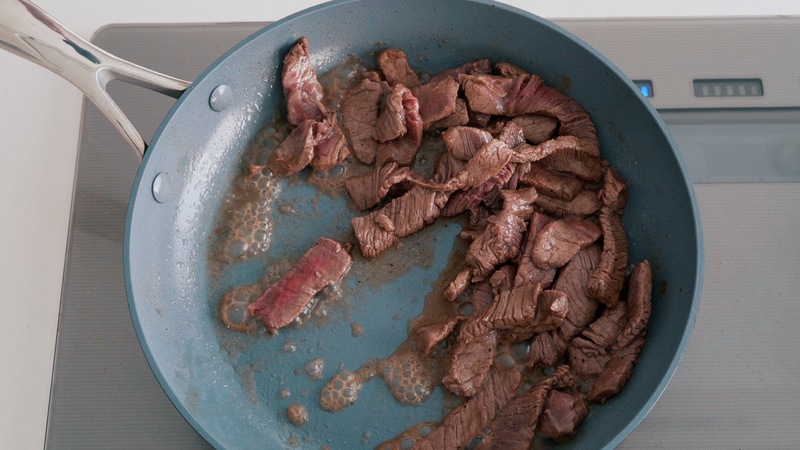 Meat has a tendency to expel liquid as it cooks, which makes it very difficult to season in a quick stir-fry. 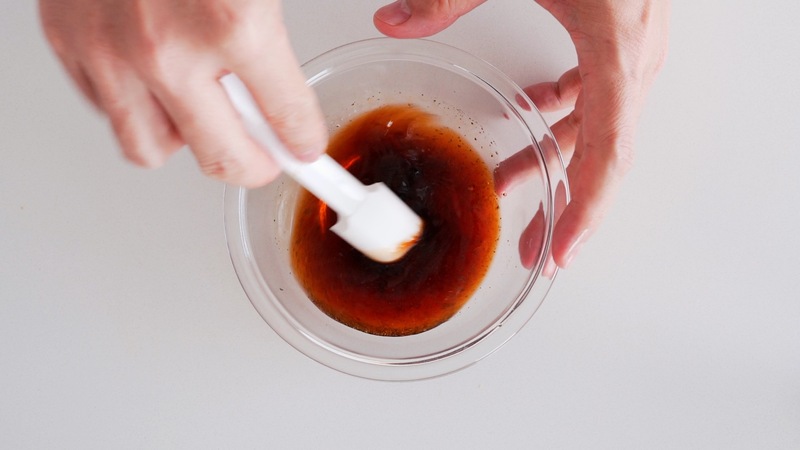 By marinating it beforehand, you can ensure that it’s seasoned to its core. 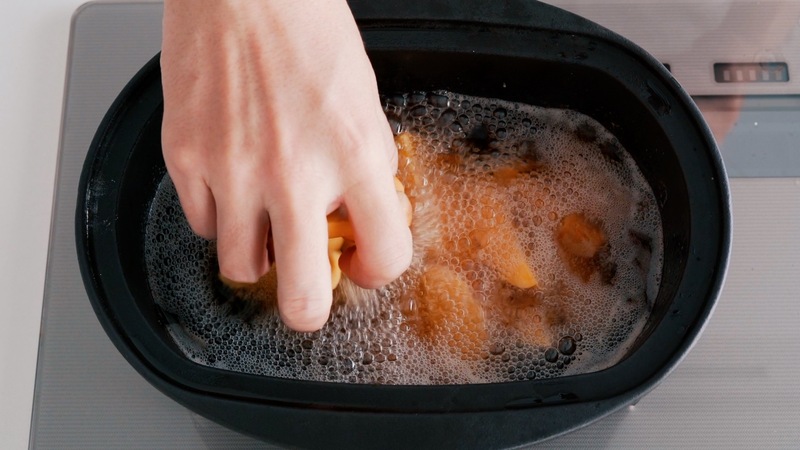 Because stir-fries are cooked hot and fast, you’ll want to prepare all the other ingredients that are going into it and have them near your stove, so that you can add them in one after the other. Cooking the stir-fry too slowly, or not having everything ready will result in things getting overcooked, or even burnt. I usually start frying the potatoes just before I start the stir-fry, this gives them just enough time to cook through and crisp up. I also prep the sauce for the fries so I can toss them as I drain them. 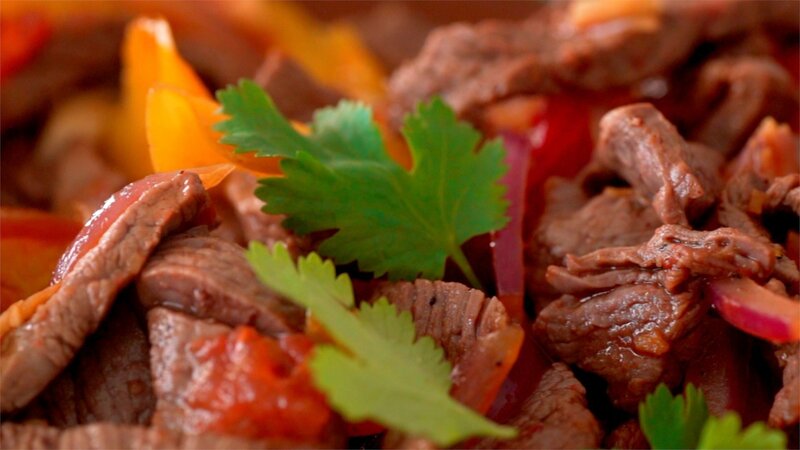 Like most stir-fries, Lomo Saltado is cooked in stages. It starts with ginger and garlic, and then the meat gets quickly browned before being removed from the pan. The reason for this is that leaving the beef in the pan while you stir-fry the veggies will cause it to get overcooked, which will make it tough and dry; by cooking it in this order, and transferring the meat out of the pan, the browned juices from the beef coat the vegetables, imparting a wonderful savory flavor to them. Once all the veggies are cooked (but still crisp), the beef gets added back in, along with the tomatoes. This gets tossed together with the remaining sauce and plated up with the french fries and some cilantro on top. To make the marinade for the Lomo Saltado, mix the soy sauce, pisco, oyster sauce, red wine vinegar, and black pepper together in a bowl. Add the sliced beef to a bowl and marinate with half of the sauce. To make the sauce for the fries, whisk together 1 tablespoon of red wine vinegar, 1/2 teaspoon of salt and some chopped cilantro. When the oil is up to temperature, add the potatoes and cook until the french fries are golden brown (about 7 minutes). 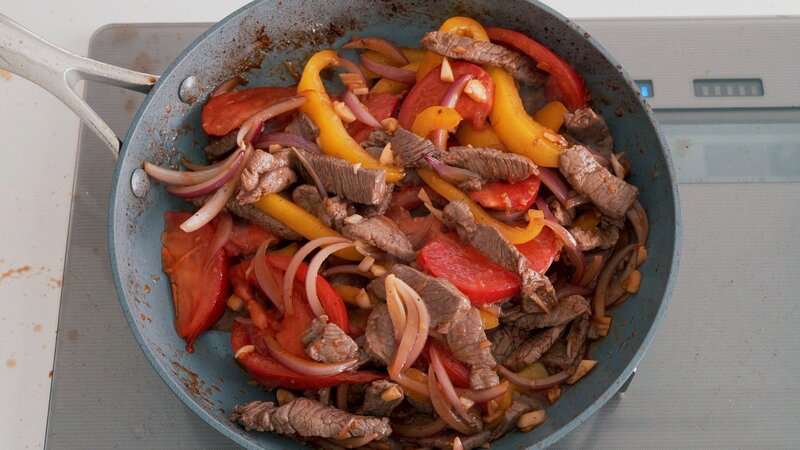 To make the Lomo Saltado, add 1 tablespoon of oil to a large frying pan over high heat. When the pan is hot, add the marinated meat and stir-fry until the beef is almost (but not completely) cooked through. 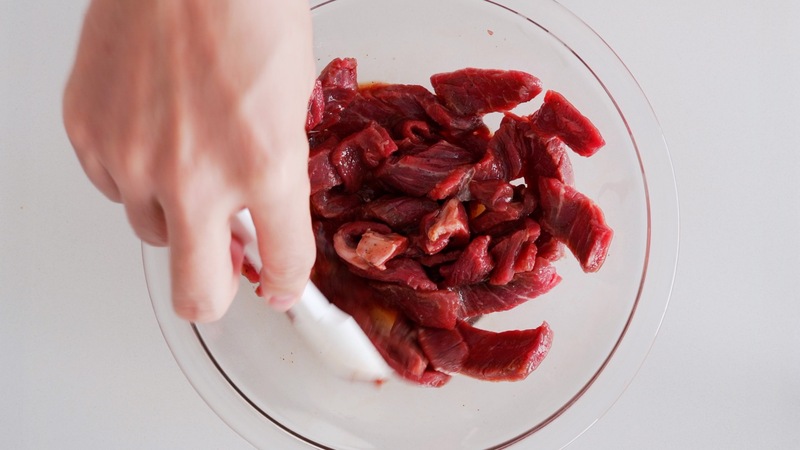 Transfer the beef into a bowl and set aside. 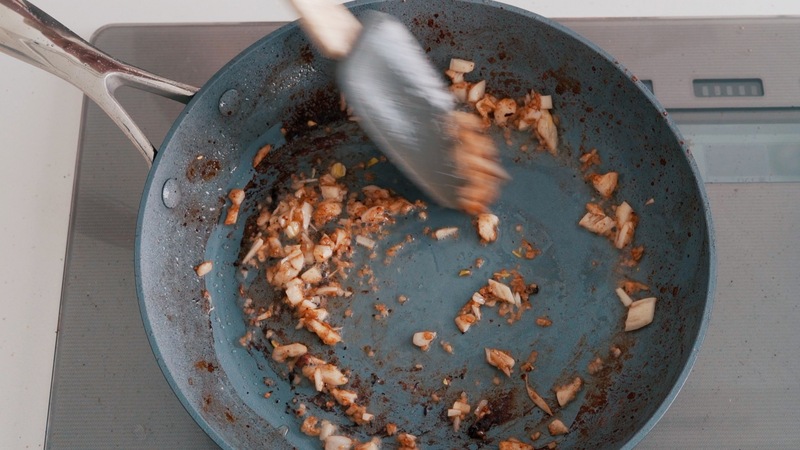 Add the remaining tablespoon of oil to the frying pan and add the garlic and ginger. Saute until the aromatics are fragrant (about 30 seconds). 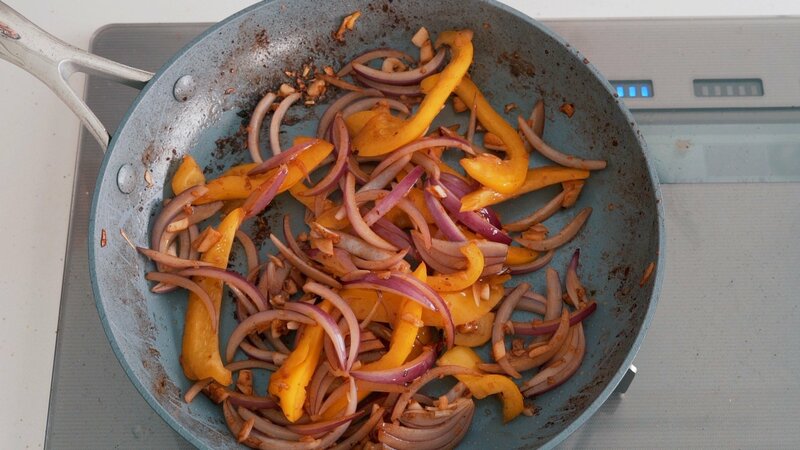 Add the red onions and peppers and stir-fry until the onions are cooked through, but still hold their shape. Add the tomatoes and beef back into the pan and then add the remaining marinade. Toss to coat evenly. 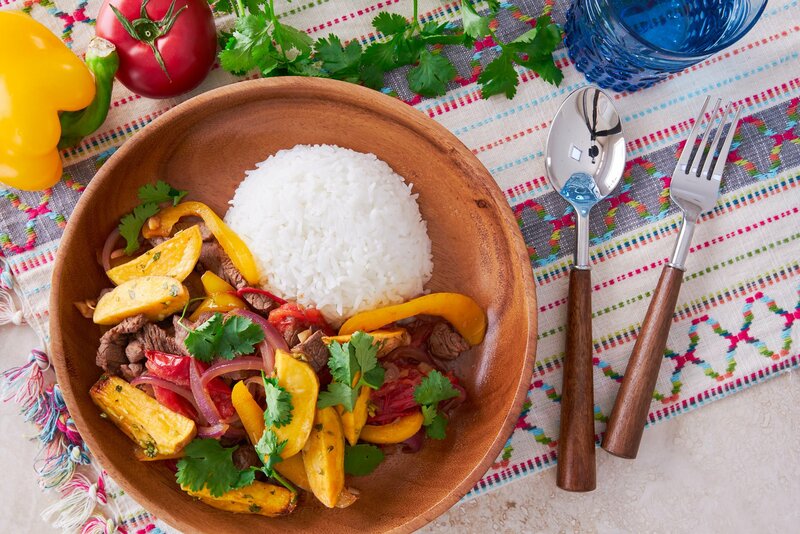 The Lomo Saltado is done when the sauce has caramelized around the ingredients. Do not overcook this; otherwise, the tomatoes will leach out a bunch of liquid, making your stir-fry watery. 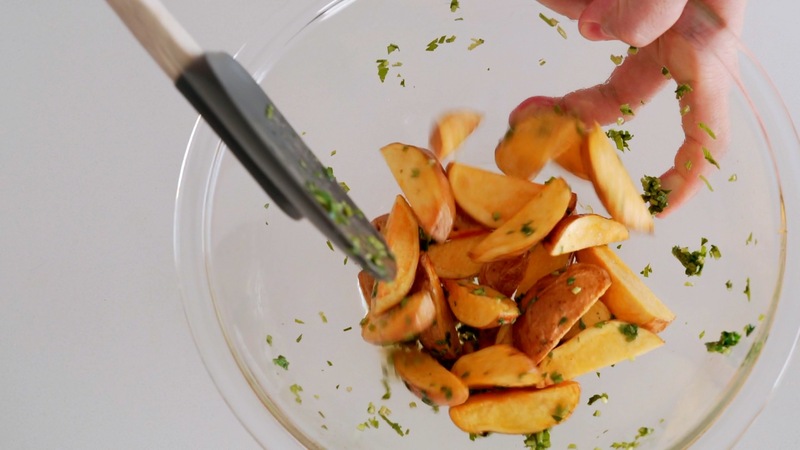 When the potatoes are done, drain and transfer them directly to the vinegar and cilantro sauce and toss them around to coat evenly. Plate the beef with rice and fried potatoes and then garnish with the cilantro. Enjoy it with your favorite hot sauce if you want to add some extra heat. Making YouTube videos takes a lot of time (I spent almost 3 full days shooting, and editing this one). I enjoy making them, but if you guys don’t find them that useful, I want to focus my energy elsewhere. So what do you think? If you want to keep seeing these, please head over to my YouTube Channel and let me know by giving this video a like 👍🏼, Subscribing to my channel, and leaving a comment to let me know what you think.